CALGARY, May 2, 2017 /CNW/ - WestJet announced today a definitive purchase agreement with The Boeing Company for up to 20 Boeing 787-9 Dreamliner aircraft. This agreement includes commitments for 10 Boeing 787-9 aircraft to be delivered between the first quarter of 2019 and December 2021, with options for an additional 10 aircraft to be delivered between 2020 and 2024. The airline also announced it has selected General Electric's GEnx-1B engine for the 787. "This order represents an exciting new chapter in WestJet's history," said Gregg Saretsky, WestJet President and CEO. "We have carefully executed on our strategic plan, first launching WestJet Encore to connect smaller communities across Canada to our growing network followed by our successful venture into wide-body flying to Hawaii and London Gatwick. Now, with the most sophisticated commercial airliner available, we turn our attention to further growing our international presence and introducing even more travellers to our award-winning guest experience." 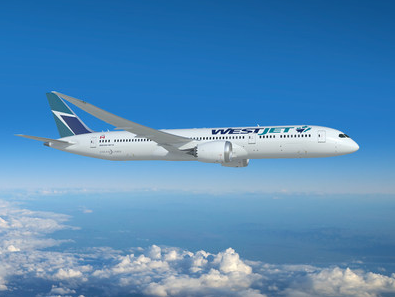 This is big news for them, obviously despite some teething issues with their quarter century old 767s the long haul market seems to be working for WestJet. Next up according to the press release will be more European, South American and Asian routes. It looks like WestJet's route map will grow into resembling one of the airlines they helped knock off, Canadain Airlines! Seeing that the planes will start to be delivered in under 2 years I wonder if this means WestJet will stick with their current 4 767's for the time being or if they are still planning on bringing on some of the old birds and then replace them with the 787. Also we don't know what configuration WestJet will put in the planes? Will we see a true business class or will they stick with their economy/premium economy mix. If we look at Norwegian who flies the 787-9 out of Europe to the U.S. and other long haul destinations they only do premium economy and economy (35 and 309 seats respectively) so it is entirely possible WestJet will stick with what they know and do something similar to Norwegian. What are your thoughts on WestJet's move to acquire the Boeing 787-9 Dreamliner?